Hudson – Maria Do Carmo Braga (Frias) Santos, 83, passed away peacefully at home, surrounded by her loving family, Sunday, Nov. 27, 2016. Her loving husband of 56 years, Antonio F. Santos, passed away in 2011. 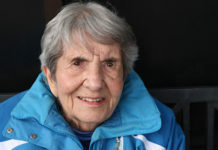 She was born in Santa Maria, Azores, Portugal, the daughter of Jose Joaquim and Maria Da Gloria (Braga) Frias and has lived in Hudson since 1974. She leaves 12 children, Jose Manuel Santos, Antonio Santos, Dinis Santos, Joao Santos, Maria Do Ceu Chaves, Marcia Monteiro, Dimas Santos, Aida Santos, Regina Martins, Aristides Santos, Armindo Santos, and Michael Santos; her brother, Joao Braga Frias; her sister, Aldina Braga Frias Chaves; sisters-in-law; brothers-in-law; 23 grandchildren; 10 great-grandchildren; and numerous nieces and nephews. She was predeceased by her daughter, Aida Do Carmo Frias Santos; her brother, Antonio Braga Frias; and her sister, Tiolinda Frias Coelho. Mrs. Santos was a member of St. Michael’s Church, and was a faithful wife, a devoted mother, and a loving grandmother. She will be sadly missed. Relatives and friends are invited to attend calling hours Thursday, Dec. 1, from 5-8 p.m., in the Tighe Hamilton Funeral Home, 50 Central St., Hudson. Funeral services for Mrs. Santos will be held Friday, Dec. 2, with a 9 a.m. Mass of Christian Burial in St. Michael’s Church, 21 Manning St., Hudson. Burial will follow at St. Michael’s Cemetery in Hudson.